So here is a rare miss from Ninkasi, and oh what a miss it is. 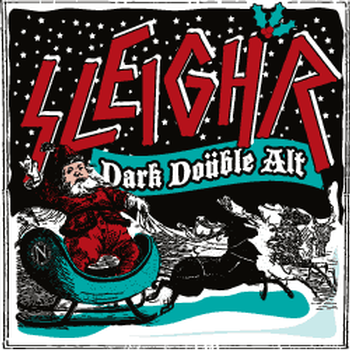 For being a winter seasonal nearly everything that could go wrong has gone wrong with Sleigh'r, and only die-hard Ninkasi fans should bother with it. It pours a dark brown color and looks just fine with a decent head. Lacing is decent. Hey, from the looks of it you'd think it was a good beer, and nose is just as deceiving. Slightly spicy and with a bit of Christmas-y fruits, I was expecting the beer to embrace me like a creepy mall Santa. Then disappointment hits. The mouthfeel here is somewhere beyond thin, almost like drinking water with the flavors separated from the overall product. Now, I don't expect every winter ale to be thick, but Sleigh'r is ridiculous. It's like Ninkasi decided to water it down. This is water with a bit of beer thrown in. That's too bad, because the flavors are there, hiding deep beneath. You can just pick up on some sweet and spicy holiday flavors down there. But there is no Santa embrace here, oh no, it's more like Santa had his elves remove you from the premise telling you Christmas was cancelled this year. That's right, that's what Ninkasi has done to us: They have canceled Christmas! I, for one, don't want to see Christmas canceled, and therefore I implore you to check out some good winter seasonals this year. On top of my list so far is Big Sky's offering, but I will chance trying some other ales, just for you. Because I don't want you to see Christmas canceled. Vote for Ninkasi Sleigh'r: It’s your civic duty!